There will be a lot of exciting new titles and events coming your way in 2019. Follow @qepbooks on Twitter for the latest. you knowledgeable and efficient service. 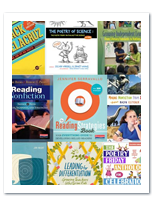 QEP has been in business over 32 years as the one-stop shopping source of professional books, supplemental curriculum resources, and classroom titles for K-12 educators. Our staff has the combined experience of over 35 years serving our customers and we represent more than 40 publishers, including Stenhouse, Corwin Press, Scholastic, Jossey-Bass, Solution Tree and ASCD.